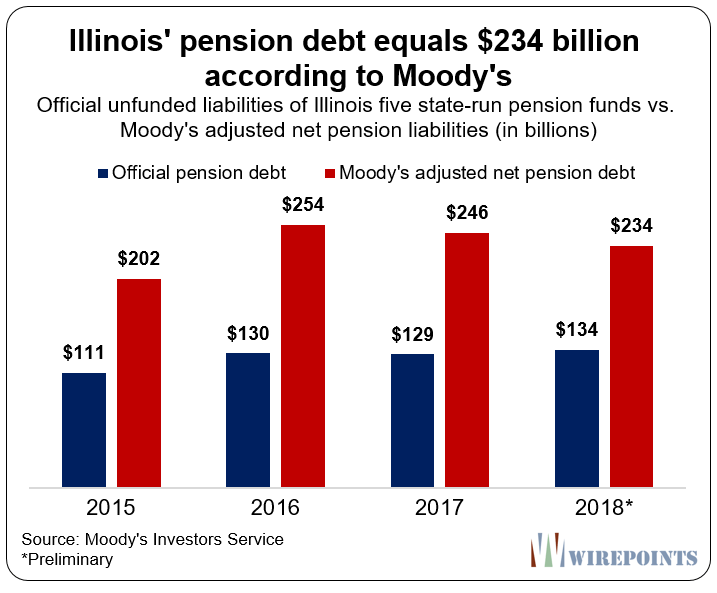 Moody’s recently released what fiscal realists would say is the true estimate of Illinois’ unfunded state pension liability – $234 billion. The rating agency’s calculation dwarfs Illinois’ official shortfall estimate of $134 billion – the amount Illinois politicians say is needed to fully fund its five state-run pension plans. Moody’s uses more realistic assumptions than the state does to arrive at Illinois’ debt total, resulting in the $100 billion difference. That’s a huge problem for ordinary residents and pensioners. If Illinois already can’t pay its debts under the state’s rosey assumptions, it will never be solvent under more realistic assumptions. The problem is even bigger than that. Moody’s numbers for Chicago and the Chicago Public Schools are nearly double what the official numbers say. Politicians can continue to underreport reality, but they can’t escape what everybody else is saying – from Moody’s to J.P. Morgan to the Hoover Institution – that Illinois has far more debt than the political class says it does. The biggest driver of the difference between Moody’s calculation and the state’s official numbers is the discount rate – the rate used to determine just how much the state owes in pension benefits. Moody’s most recent analysis used a rate of 4.14 percent – what it says is a far more appropriate measure of Illinois’ risk. Moody’s methodology is broadly accepted by fiscal realists, including Nobel-winning economists and other pension experts. In contrast, Illinois’ state government uses a rate of about 7 percent to calculate its pension debt. Not surprisingly, some politicians, the unions and many in the actuarial industry dispute the use of lower rates. They see any attack on assumptions as an attack on pensions themselves. Regardless, the public pension industry is slowly but surely lowering their discount assumptions. The changes reflect the pressure brought on by requirements to more properly report pension debts and by more critical reporting by financial institutions like Moody’s. 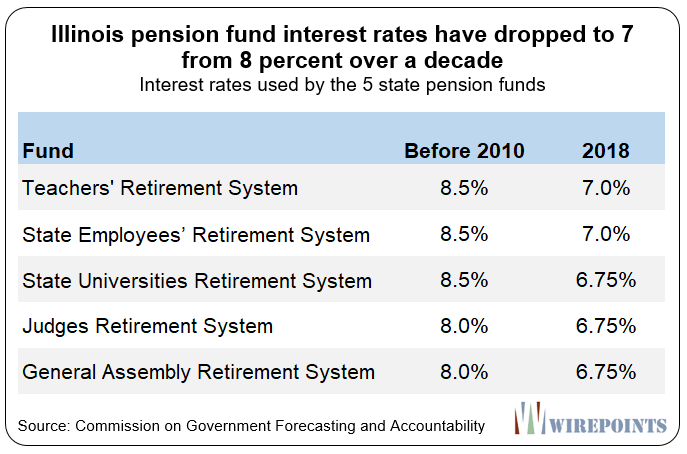 The Illinois Auditor General’s recent pension report highlights how rates used by pension funds across the nation are on their way down. In 2001, more than 100 of the nation’s 128 largest pension plans used discount rates above 8 percent. Today, just six plans use rates above 8 percent. Illinois is one of those states that’s dropped its rates below 8 percent in more recent years. However, the state’s official rates continue to be far higher than the discount rate used by Moody’s. Hence the $100 billion reporting difference. It’s not just the state debt that’s being underreported. The same goes for municipal pension funds across the state. Take Chicago, for example. Or more importantly, what a Chicagoan owes. The official burden versus the more truthful burden is dramatic. Under official numbers, Chicagoans’ share of overlapping Illinois retirement debts totals $86 billion. 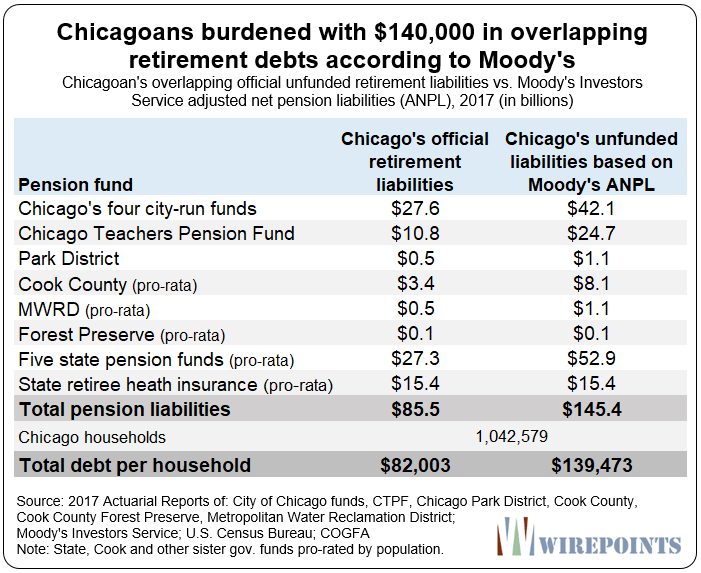 But under Moody’s pension numbers, the total debt jumps to $145 billion (that number includes Chicago’s share of the state’s $73 billion in retiree health debts, shown below). The debt numbers have become so untenable that Illinois politicians and unions are underplaying them. It’s the only way they can peddle the “fixes” they want – like pension obligation bonds, debt reamortizations and tax hikes – rather than policies that actually address the underlying problem of too many promises and too much debt. Politicians can try and ignore reality, but the rating agencies, the bond market and the stock market won’t let that denial go on forever. Moody’s is just one of what’s becoming an ever-louder chorus. The bottom line is Illinois has more debt than it can handle. Illinois needs a constitutional amendment to its pension protection clause that will allow those debts to be reduced in an orderly matter. If not, the markets will force chaos, and that won’t be pretty for anybody. Just watch…. Moodys will still “reward” the state with a non junk rating, in spite of all the math. Bond rating is no longer about math, its now about screwing over taxpayers, its a “screwing over rating” not a fiduciary rating. Moodys will wait to see how well the pols screw us over, then reward the state for a job well done. Moodys is the other side of the ponzi, the bond supply side, they need to keep the yields both attractive and valid for institutional investors. Or this all falls apart, moodys is not your friend. I agree; an investor would have to be a fool to put any faith in the rating agencies. I’m not a financial guru but my research shows that equities have averaged approximately 7% real return over the long haul based on about 100 years of history. Isn’t discount rate supposed reflect expected real return or am I missing something? Problem is that the Pension Funds aren’t 100% invested in the DOW or S&P index. They’re invested in bonds and some alternative assets like real estate and hedge funds. God forbid out of stupidity Illinois is now investing in BITCOIN! The Illinois Democrats Desperately need a good Stock Market, so they have no choice but to Support Trump and not Cortez! Thanks PM, Doug, Nixit and others that responded to my initial question. Missing the most important part: we don’t have a 100 years of time before massive payouts take place. In other words, we are not worried about the long haul here but the next 10-15 years. If our fearless leaders were thinking about the long haul they would have made the contributions in the past like they were supposed to. You are correct, the biggest risk now is what is known as sequence of events and the sequencing does not look favorable at all. One point of disagreement, if our leaders thought of the long haul they never would have offered or continue to offer a defined benefit plan. The correct course is to terminate the public employees and privatize their jobs, thus getting around the courts interpretation of the diminished clause. I agree with the sentiment PM. I would love to see Illinois politicians tell all the public union employee’s “You’re Fired.” Maybe the guy in the white house could help out. I hear he has some experience with this sort of thing. Mike, This is the natural end game, privatization of government union jobs. The only ? is what will this, “Scorched Earth Death Spiral” path the Democrats take Illinois through, will look like. Shocking that I read yesterday that Chicago’s total pension debt is greater than 44 of the 50 states. Frickin out of control!